I have never been a big London Broil fan, but when one mysteriously showed up in my grocery bag last week (along with a ham steak and filet mignon I also didn’t purchase — score!) I decided to make good use of it. In general, London Broil can be tough, so it’s always wise to marinate it first — and the longer the better. I set off in search of a recipe that was both highly rated and contained ingredients currently located in my pantry. Not always an easy order to fill, but I got lucky! The boys and I loved this, and there was not a scrap left over. I served it with some green beans and everyone’s favorite potatoes. This is a simple, versatile marinade I will be using again for sure. Mince the garlic to a paste with salt and in a blender blend with the salt, red wine, balsamic vinegar, soy sauce and honey. 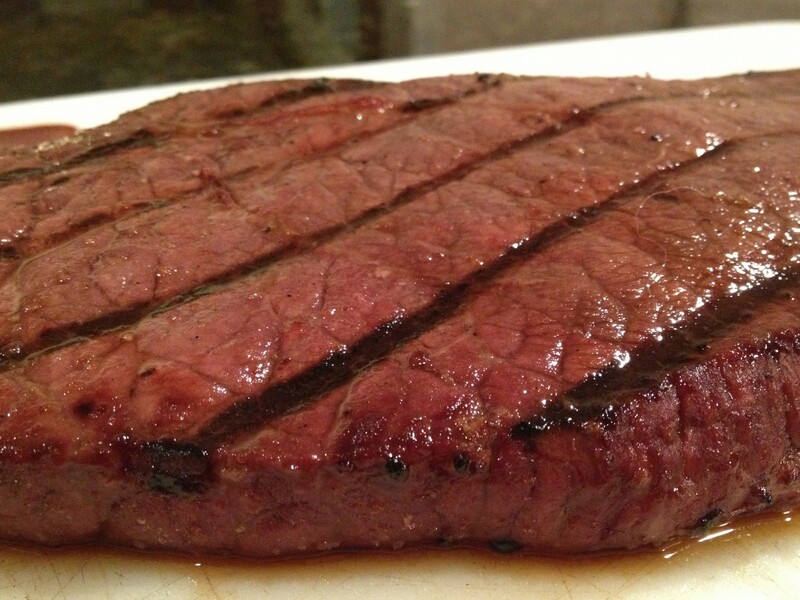 In a heavy-duty sealable plastic bag, combine London broil with marinade. Seal bag, pressing out excess air, and put in a shallow baking dish. Marinate steak, chilled, turning occasionally, at least 4 hours and up to 24. Bring steak to room temperature before grilling. Remove steak from marinade, letting excess drip off, and grill on an oiled rack set 5 to 6 inches over glowing coals, 7 to 9 minutes on each side for medium-rare. Transfer steak to a cutting board and let stand 10 minutes. Holding a knife at a 45-degree angle, cut steak across grain into thin slices. This entry was posted in Main Dish and tagged London broil marinade, red wine marinade, steak marinade by Mom Mom's Apron. Bookmark the permalink. That sounds like a great marinade and it looks like you cooked your steak perfectly! Yum! I love London Broil. I would eat it once a week. I will try the marinade as soon as I can gather all the ingredients (and gf soy sauce). I tend to broil mine in the oven but I bet that won’t make much of a difference.